After releasing Nokia 6 early this year, running on Stock Android 7.0 Nougat OS; a new version of Nougat has started rolling out to the device (Android 7.1.1 Nougat). The update is set to fix April security issues and as well fixed some minor bugs. The update weighs in at around 370MB. You need data of about 400MB to be able to carry out this update, or even connect to a Wi-Fi network. As we all know the case with OTA roll outs, the update might take a little time to hit your device via notification; but if you feel impatient, you can head over to your handset's Settings menu >> About phone >> System update. 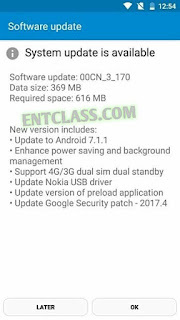 Nokia 6 android nougat update 7.1.1 and 7.0. Update Nokia 6 to latest Android 7.1.1 Nougat version. I hope it comes preloaded for those ones not with the end users yet. Uhhgghh!! All phones are releasing update for their os.. Wen will Xtouch release dia own update..